When we started the retreat I had no idea that I would learn the amount I learned today. Meditating and sitting in one place sure was difficult but the valuable insight we got from the first day clearly outweighed the hardships. As the day progressed we meditated and discussed suttas. Through the entire day my favorite part was the Dhamma talk portion, because I loved hearing all of Bhante’s experiences as a monk. It was also the perfect time to get all my questions about Buddhism answered. Being a young adult born into Buddhism I have many questions regarding Buddhism as a whole and instead of following it because my parents told me to do so, I rather figure it out for myself. 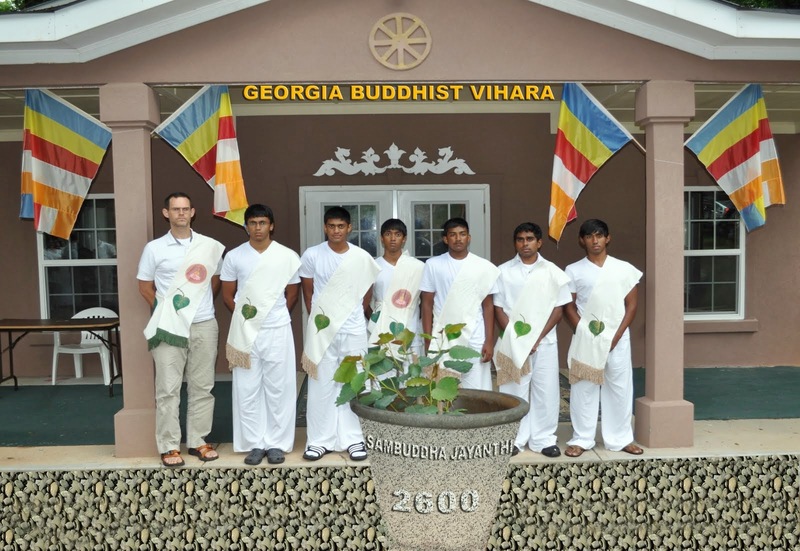 This program offered exactly what I needed to see and learn why Buddhism is so great. As we read the suttas about the Buddha’s life and his encounters, I was amazed by how he was able to answer all these puzzling questions nearly 2500 years ago. Throughout the day we had a guide, Justin, who would show us how to prepare the Buddha Puja, and the proper etiquette when being around the monks. Justin had a very interesting story about his life which I was surprised to hear. He said that he was raised in the South, and that he was a complete Christian American, but even as a child he was attracted to Buddhism and Asian cultures. He told me how his mother used to take him to the library and how he would check out books on Buddhism. Maybe in one of his past lives he was a devout Buddhist? After lunch we split up into groups and did chores around the house, Mathishka and I were sent to do garden work, which surprisingly was very enjoyable. Just listening to all the nature around you for once was a dramatic change in my busy school life and I absolutely enjoyed it. To end the day we went to bed at 9PM after having a milkshake that Bhante, so kindly prepared for us. I haven’t gone to bed that early since I was in middle school. Today was the start of our early morning meditation, and to my surprise waking up at 5 am wasn’t difficult at all; probably because we went to bed so early with not much to eat. When we woke up it was like everything in the world was still sleeping, the birds, the people and even the wind. We went to the shrine room and Bhante instructed us to sit down and we proceeded with the meditation session. There was no sunlight coming in through the windows as we sat down in the shrine room, everything was at a standstill. As the meditation began I felt my mind drifting, looking for things to be distracted to, but because everything was so quiet my mind was able to ease up and simply focus on my breathing. It was amazing, never have I ever felt that peaceful and content. As the meditation came to a close and our minds came drifting back into reality, I started hearing the birds chirping, I felt the sunlight on my body, and heard the cars zooming by… As if the entire world came back to life while we were calming our minds. After offering the Buddha Puja, we had breakfast and came back to the shrine room to talk about Satipattana Meditation, or Mindful Meditation. We discussed many things such as “Seeing the body as a body”, the nine type of feelings and even spiritual happiness/sadness. After lunch we all went to plant blue berry trees in the garden. Digging the holes was difficult but we managed to plant the two trees. It was good to be able to stretch our arms and legs and do some physical activity while on such a spiritual retreat. Later in the day we went to visit a Vietnamese temple. The temple was grand, with huge statues of the Buddha and other various forms which they believed in. They had an immense field for Buddhist celebrations filled with a stage, parking lot, and even peacocks. It was interesting to see that unlike us, the Vietnamese Buddhists also worshipped many other bodhisattvas, one being a female with the name “Kon yin”. Another interesting thing I observed was the mutual respect that the grand Vietnamese monk had with Bhante. Although two different sects of Buddhism, in the end it all was derived from one person, the Buddha, only to make ourselves better human beings. Today was my last day on the retreat because I had to attend my university. Nuwan and I were assigned to prepared the Buddha Puja this morning which meant we had to get up a bit earlier than usual. After another soothing early morning meditation we had breakfast and then took part in the walking meditation which was very relaxing. We were told to walk anywhere we wanted but be mindful and observe the tips of your feet as they pressed on the various surfaces. After lunch we discussed the things that were essential to living, and Bhante also read us articles of well-known philosopher and their positive outlook on Buddhism. To see that our religion isn’t criticized by anybody and always spoken highly of is very motivating. After lunch we uprooted a tree and planted in a better location. The task was difficult and to my surprise even the monks assisted in this. Before everybody left to go on our daily temple visits, Bhante asked me to come to the shrine room to terminate my Das Sil. As I was terminating, I had a whole rush of feelings come towards me. I realized how peace at mind I was at the temple, meditating and focusing on my mindfulness. The retreat was an amazing adventure and opportunity for me and if I could I would do it again. I gained so much valuable knowledge about my religion that I can call myself a true Buddhist. I think this is a program that every Buddhist should experience at least once in their lives. The famous Buddhist quote “Come and see” would be the perfect way to explain this retreat. What I feel? Youth retreat experiences.